Holtwood Methodist Church has been described as a “Spiritual Oasis” set in a beautiful rural location a few miles north of Wimborne in Dorset (UK). Our aim is to serve God in our community and beyond, to help to spread the Good News that Jesus is alive today and that, through faith in him, we too can enjoy life eternal. The great commission given to Christians by Jesus is that we must take this Good News to everyone – so that we may all decide for ourselves whether we are on Jesus’ side or against him – for there is no middle road! 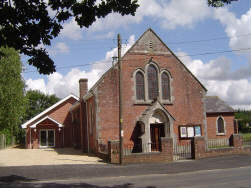 Our Christchurch & Wimborne Methodist Circuit website is here where you can also find out what’s happening in the Circuit and at other churches locally – and further afield.